« Who’s up for husking Prager’s corn? Oxy-Blog is being revived! 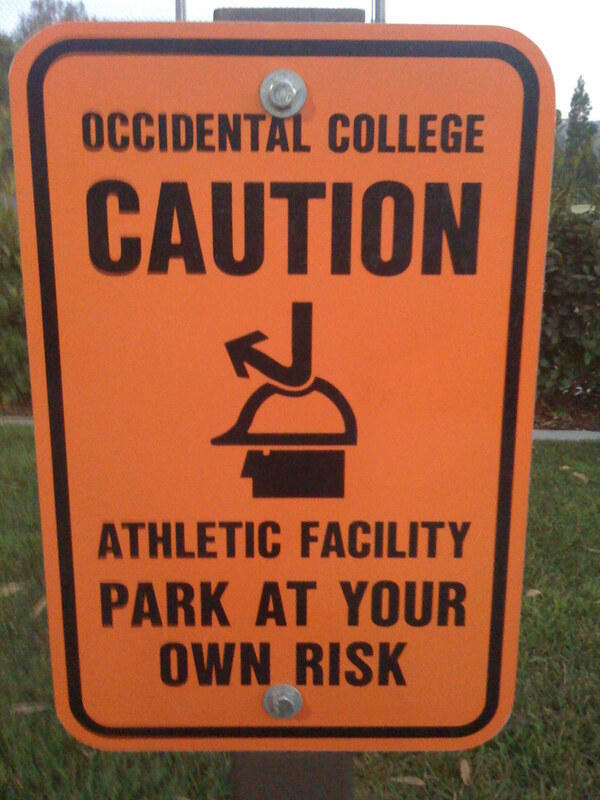 Also: Oxy still has silly signs. Oxy-Blog is coming back! We know, we know, the last post to Oxy-Blog was in October of last year, and anybody who actually read it has probably long since stopped checking it. That’s okay, hopefully we can build a reader base again. With good content comes eyeballs, and it’s time for this blog to get rolling once again. Look for more news worthy posts in the near future. Trust us, we’re not kidding around this time– they’re coming. This sign is located by the softball field, and it clearly warns that, if you park there, you might get hit in the head with an arrow (which, if you’re wearing a hard hat, will be safely deflected). This entry was posted on August 31, 2008 at 12:08 am and is filed under Uncategorized. You can follow any responses to this entry through the RSS 2.0 feed. You can leave a response, or trackback from your own site.